Staying on top of household recalls is critical for homeowners in order to ensure their safety. Now that winter is upon us and homeowners will be using their furnaces more frequently, it is important that you are made aware of a recent recall involving Emerson branded thermostats that can pose a fire hazard. Here is a quick overview of everything you need to know about this recall. On December 12, 2018, White-Rodgers announced a recall of nearly 150,000 Emerson branded WiFi thermostats manufactured in China. These units have been recalled by the manufacturer due to the fact that contact between the thermostat’s wires and the household line voltage can damage the thermostat, posing a potential fire hazard. At the time the recall was announced, White-Rodgers had received eight reports of burn damage to thermostats that resulted in minor property damage. 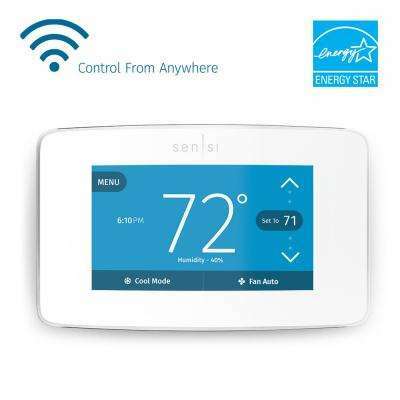 The recall affects Emerson branded Sensi WiFi thermostats. The affected units have the brand name “Emerson” printed on the front and a manufacturing date code from 1416 to 1536. The thermostats are white with an LCD screen, and they have model numbers 1F86U-42WF or UP500W. You can find the model number and date code on the product label on the back of the thermostat. These thermostats were sold by Johnstone, Home Depot, and Golden State FC stores, as well as by HVAC distributors nationwide, from April 2014 to December 2016 for between $100 and $150. If you believe that your thermostat is one of the affected models, you may be wondering what your next step should be. As with all recalls, your best course-of-action will be to contact the manufacturer to confirm that your product has been recalled as well as to find out about having your thermostat repaired or replaced. However, feel free to contact one of our trained appliance specialists with any other issues you might run into with your home’s HVAC system.